The bead breaker blade is attached to the side of the tire changer, and it’s one of the most essential steps in changing a tire. Every tire has a bead that runs along the edge of the tire. Wheels have a small groove that secures the bead, so the tire can safely inflate. Once caught, the bead is difficult to remove without the proper tools. Attempting to do so will probably tear or weaken the structural integrity of the tire. Ranger’s bead breaker blade makes the job of breaking a tire bead look easy. 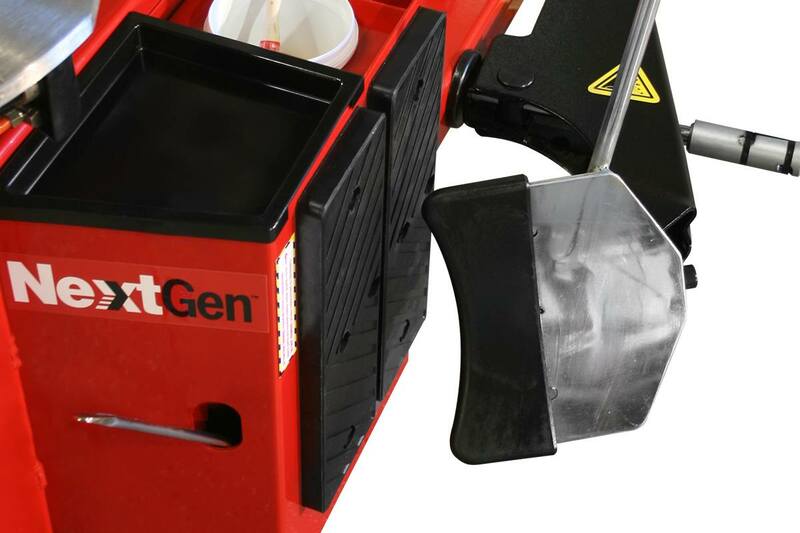 The pneumatic-powered blade penetrates through the toughest beads without a problem, and some tire changer models have blades feature hands-free operation. However, if done incorrectly, breaking a tire bead can tear tires or mar expensive wheels. In the past, a blade would sometimes get stuck inside the tire. Only Ranger features an improved bead breaker blade design that protects your equipment, as well as your customers' property. This is done with a spring-loaded alloy steel wedge that safely keeps the blade from entering too far into the tire. Once the blade has entered past the point of the bead, the spring will snap back and take the blade with it. The breaker blade is protected by a non-marring polyurethane sheath. In the past, stiff tire walls could rip these sheaths off, but Ranger makes sure the sheath is secure over the blade. At no time will any steel make contact with the rubber of your tire, so there’s almost zero chance of the blade ripping the tire (as long as the blade is operated correctly). This feature is a Ranger exclusive and is built into every tire changer we make.